We’re all familiar with badge engineering, right? It’s the magical process by which a carmaker can make a whole new car just by changing the car’s name, badges, maybe lights, and bits of trim and possibly a body panel or two. While this works for many cars, there’s some that seem to be badge engineering-proof. I think I found the hardest modern car to badge engineer, and I think I found a way to do it. For a car to successfully be badge engineered, it needs to be able to be easily modified enough to at least seem like a different car. Take the Fox-bodied Mustang and its badge engineered twin, the Mercury Capri. Sure, they were the same car, but the Capri got a different grille, trim, wheels, interior, taillights, and a distinctive bubble-window rear hatch, and as a result it does feel notably different from the Mustang. I mean, nobody is getting fooled, but it’s something. Badge engineering isn’t quite as common as it once was, but it still happens, especially with car brands in different countries, like the Chevy Volt and its badge engineered sibling, the Opel Ampera. So, what car would be the hardest to badge engineer effectively? 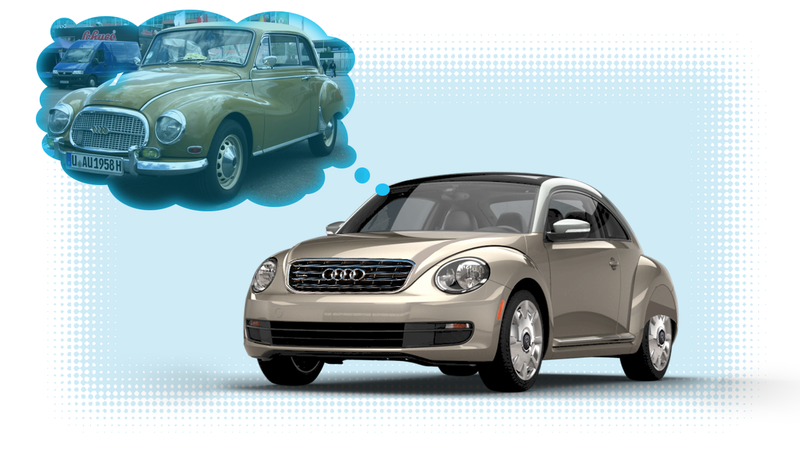 I think that answer is pretty easy: the current Volkswagen Beetle. The modern Beetle is such a specific retro-inspired design that making it look like anything other than a Beetle would be nearly impossible. So how can we make it work? Well, let’s see what we would badge engineer it into. Badge engineering usually happens across brands owned by the same company, which gives us Audi, Skoda, Bentley, Porsche, and Lamborghini under the VW umbrella. Let’s say we want to move the Beetle upmarket a bit, and give Audi something for their bottom end in the U.S. market. We’ll improve the interior and trim on the car to Audi levels, but how do we make it feel like an Audi? All we can do is change maybe two body panels and some trim, maybe the lights. We’re stuck with that archaic shape, and those separate round fenders. So what do we do with such a distinctive, retro design? We go retro as well! Luckily, Audi has some history. Way back, when Audi was just part of Auto-Union, there was a car called the DKW 3=6, a popular two-stroke small car. That car eventually got a four-stroke motor, and became known as the Auto-Union 1000. Eventually, Auto-Union became Audi and then part of Volkswagen, which means that the curvy Auto Union 1000 is part of Audi’s heritage, and now Volkswagen’s as well. We can also tweak the Beetle to be a sort of passable modern interpretation of the Auto Union 1000 by adding a new hood and grille assembly, wheels, a rear wheelskirt to mimic the original car, and by making the roof and pillars a contrasting color, usually white, again, like the 1000. With all that, I think Audi could sell a tweaked Beetle as their entry into the premium city car space, which I like to pretend is a potent, growing segment. I like to back this up by telling myself lies about how well the Aston Martin Cygnet sold. I think I’d call the car simply the Audi 1000. It’s going to be huge. If anyone can think of a harder car to badge engineer, and a better solution, I’m all ears. Well, technically, all eyes. But those eyes will be all ears.